The well publicized Rim Fire firestorms that are ablaze near Yosemite National Park spreading at about 10,000 acres a day were not the only things burning in Northern California over this last weekend. In a very hotly contested 15th race in a 19 race season, Penske Racing's Will Power survives seven YELLOW Flag full-course cautions (a Sonoma Raceway IndyCar race record - five took place before lap 30 of 85 was completed), tightly packed restarts, and a pit stop incident with Ganassi's Scott Dixon to secure his first win in 26 races ... dating back to April of 2012 in Brazil. With scant few chances to rein in the winning ways of season championship points leader, Penske's Helio Castroneves, Target Chip Ganassi Racing's Scott Dixon was hoping to cut into the 33 point advantage Helio had over his goal at a IZOD IndyCar Series (IICS) Championship. Scott had done everything right in qualifying at P2 next to his P1 team-mate Dario Franchitti and ahead of Helio's P5, staying out of trouble through the caution-filled Sonoma hills affair by leading a lap (1 point) and leading the most laps (3 points), and by keeping Will Power, Helio's team-mate behind him on the track. That is, UNTIL final pit-stops on Lap 64 of 85 when Will Power and Scott Dixon came in at the same time and the rush was on to get out first. The problem came about because Will Power's pit box was right in front of Scott Dixon's box and this is exactly where the firestorm of the GoPro Grand Prix of Sonoma begins. This firestorm may never end and it involves the reaction to the pit-out actions of Scott Dixon, Will Power's right-rear crewman, the penalty ruling from Race Control, and post race statements made by Dario Franchitti, Scott Dixon, and Penske Racing's team owner, Roger Penske. On pit-out, Scott Dixon applied the torque to the rear wheels and had his rear end fishtail out of his pitbox where his left-rear slid close enough to Will Power's right-rear crewman who was carrying the removed used right-rear tire back to the pit wall, taking it off of the track, when Dixon touched Power's carried tire sending it into the air and knocking down the crewman ... which touched off a chain reaction that involved a second downed Penske team crewman. At the time of the incident, if the race had ended with Dixon in the lead, as he would have been if his car did not touch anything on the way out of the pits, and the rest of the field remained in the same positions, Dixon would have been only 8 points behind Helio in the IICS championship points race (a nice move from 33 to just 8). But driver Dixon did hit something and this can always have serious consequences. 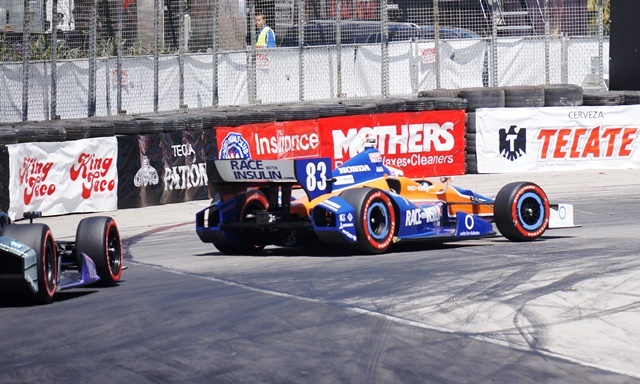 Thankfully, no one was injured enough to require medical care, but after a review from all available video, including a very helpful overhead shot, a stop and go penalty was assessed to Scott Dixon placing him deeply back in the field. 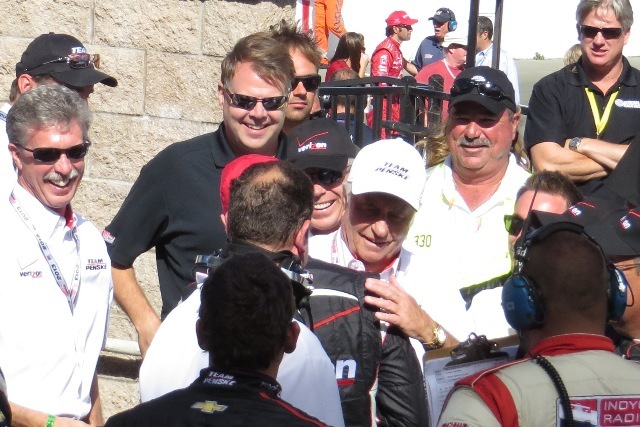 In a post-race interview with Robin Miller (Racer.com), Scott Dixon's team-mate, Dario Franchitti accused the Team Penske crewman, and thereby Team Penske, of unprofessional tactics in pitlane. Dario said - edited, "You can't be doing these, sort of, professional falls and stuff. Since I've been in CART, IndyCar, whatever ... when you are fighting for a championship, and race wins, you always end up with the guys you are fighting with the in pitlane, and there has always been that respect, and today a [professional] line was crossed. It's dangerous out there, man. I think the penalty was on the wrong team." When questioned by Stephine Wallcraft (More Front Wing.com) with this accusation in a post race press conference, Roger Penske was not very happy with the Franchitti position. “I think you should look at the tape. Our man who changed the tire picked the tire up, was running behind the car. It wasn’t that he stuck the tire out. He didn’t leave the tire on the ground where it could have been in the way. I think they’re way overplaying this thing as far as I’m concerned. Someone got hit, went up in the air. Obviously the 9 car was too close to our crew, had an accident there. The outcome is obvious. These are things that are pretty clear in the rule book. You go to 701.16 in the rule book, if a team member gets hit in the pits, there’s a drive-through. As far as Race Control was concerned, the Rule Book is king ... and there does not seem to be anything to cover what the Target Chip Ganassi Racing team drivers are accusing Penske Racing crew members of doing. This process has never been about accommodating personalities with Beaux Barfield - the job is not a popularity contest. 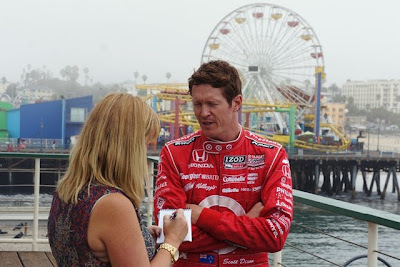 Scott Dixon, obviously, didn't agree. There were seven penalties issued in the race, including another for a pit safety violation by E.J. Viso (running over an air hose), in the contentious race. It probably doesn't help to quell the firestorm to cite Will Power's, out of context, post race quote when he said, "This year is to make sure Helio wins the championship. We're going to help him any way possible ... ."
As for the fan, the race was not a nose to tail freight train - which spells entertainment - and this firestorm will not be contained to just the competitors on the grid. This firestorm will not be surrounded and dosed out with water in the near future, what with four races left in the season this firestorm will become white hot before it dies down ... if it ever will. Obviously, here at the hills of Sonoma Raceway, professionalism ... or the lack thereof, is in the eye of the beholder. The only true innocent here at the GoPro Grand Prix of Sonoma was probably Helio Castrroneves, himself, who comes away with an additional six point advantage in the chase for his first ever IICS crown (no current Penske Racing team driver has won an IZOD IndyCar Series championship - amazing), from 33 to 39, and is the only driver in the 2013 season to complete all of the laps of every race with 1,928 circuits. The continuum of living life happens all around us as we seek our goals and fulfill our desires. This weekend will see the resumption of the 19 race IZOD IndyCar Series championship season with race 15 in the Northern San Francisco Bay area of Sears Point at Sonoma Raceway. The series is in a strong fight between Helio Castroneves of Penske Racing (who is seeking his first series championship in IndyCar), Scott Dixon of Target Chip Ganassi Racing (2-time Series champion), Ryan Hunter-Reay of Andretti Autosport (first-time champion in 2012, and current title holder), and mathematically, 17 other drivers who have a theoretical chance at the title with these five remaining races - Sonoma, Baltimore, Houston (twice), and the super speedway of Fontana. 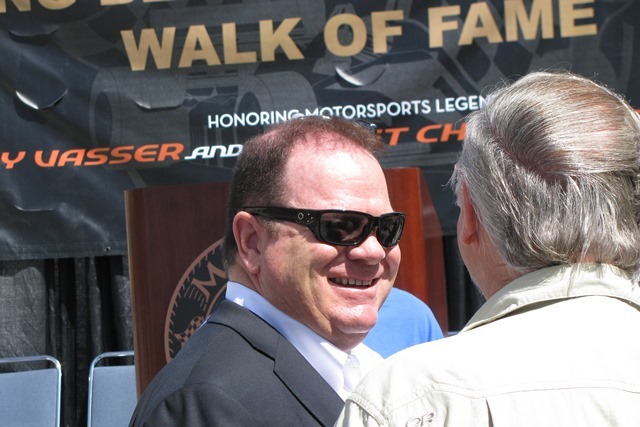 Yesterday, it was announced that the father of Chip Ganassi, Floyd R. Ganassi Sr., died at the age of 87. Floyd Ganassi was well known and one the most beloved men in the IndyCar Series paddock where he took photographs of everyone he met. Floyd was also a profound influence on one of the most serious forces in motorsports - racing team owner Chip Ganassi. Chip Ganassi's racing teams have won four Indianapolis 500 races and nine IndyCar Series championships, five Rolex 24 At Daytonas and six GRAND-AM championships Rolex Sports Car Series and one Daytona 500. "My father and mother both had a huge influence on me. They weren’t really encouraging or discouraging. They just sort of went along with my ideas and let me find my own way, helping me from time to time. They believed that experience was good. My dad is a self-made man from a small suburb of West Newton, Pa. He pulled himself up by his boot straps. He’s my ultimate hero. He started in the asphalt business and had a company called Westmoreland Paving. Then he sold that business and acquired a company called Davidson Gravel, a concrete business that supplied gravel to the asphalt people. It was a pretty big operation in the area within a 100-mile radius of Pittsburgh. So I guess I got my business acumen from him, which was valuable. My dad still comes with me to races and events and is always taking pictures. He’s there for me. He’s my No. 1 advisor." As far as the announced plans for the recognition of Floyd Ganassi, Sr.'s passing, friends will be received from 2 to 4 p.m. and 6 to 8 p.m. (local time) Tuesday and Wednesday at John A. Freyvogel Sons Inc. funeral home, 4900 Centre Ave., Pittsburgh. Funeral Service will be 10 a.m. Thursday in Fox Chapel Presbyterian Church. At this time, it is not known if "Chip" ... who was born Floyd Ganassi, Jr., will be in attendance to guide his team's best hope for a 2013 series championship title through Scott Dixon on the 12-turn, 2.385-mile Sonoma road circuit at the GoPro Grand Prix of Sonoma, but the continuum of life ... continues. 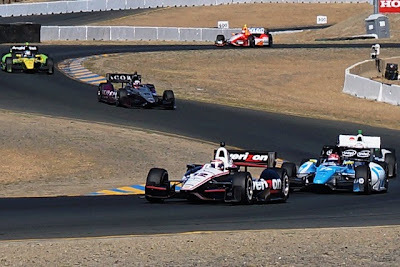 The GoPro Grand Prix of Sonoma IZOD IndyCar Series event will be held Aug. 23-25, 2013 and broadcasted on Sunday, Aug. 25 at 4:00pm ET on NBC Sports Channel, SiriusXM Channel 211, and RaceControl.IndyCar.com for live timing and scoring. We all wish Chip the best though this difficult time of transition. All of the pre-race speculation for this 14th race in a 19 race IZOD IndyCar Series (IICS) championship season had predicted a race without passing, a race where the race would be won on pitstops and pit strategy and not actual driving ability on the track, a race of fuel saving strategy where the car with the best laps per tank would be at the top of the charts, and lastly, a race where the season championship points leader would definitely loose strength of position at the end of the day due to his poor qualifications performance and a starting position of P14. Sounds kind of depressing, doesn't it? Well, on three major levels, all of these predictions came up a bust and this was all to the benefit to the ardent fan of American open-wheel racing. To the race winner, himself, Novo Nordisk Chip Ganassi Racing's Charlie Kimball, after finding out six years ago the he had diabetes and thinking this would dash his dreams of being a professional race car driver, and after two plus years of showing promise driving in the pinnacle professional racing series in North America, clinches his first-ever series win by just driving flat out and have the chips fall where they may. So much for fuel management. This 'first-ever' win was the fourth for a driver this season as Southern Californian Charlie Kimball joins the person he passed in the final laps at Mid-Ohio to take the lead, Frenchman Simon Pagenaud (Schmidt Hamilton HP Motorsports) who won the seventh race of the season - Chevrolet Indy Dual in Detroit Race 2, Former F1 driver Takuma Sato (A.J. Foyt Enterprises) for his win at the third race of the season - Toyota Grand Prix of Long Beach, and Canadian James Hinchcliffe (Andretti Autosport) - who has won three times this season - for his win in the first race of the season - Honda Grand Prix Of St. Petersburg. In the previous five seasons, there were five total first-time winners so this is a great trend. This sophomore year of the Dallara DW12 chassis outfitted with either a turbo-charged Chevy or Honda engine has made for very competitive racing ... probably the most competitive in the whole of the 21st century. There have been nine different winners in 14 races, four different teams are represented in the top five positions in the IZOD IndyCar Series championship points race, and a driver who has won the series' hallmark race three times - The Indy 500 - yet has never won the season championship, leads the points race through 14 of 19 races this season. Helio Castroneves entered Mid-Ohio's Honda Indy 200 29 points ahead of his chief rival, Scott Dixon, in the IICS season points. He had a terrible time getting his Penske Racing PPG sponsored Dallara DW12 to work well on the track all weekend long and started the race at P14. Scott Dixon, who was second, and Ryan Hunter-Reay who sits at third, qualified for the race at P3 and P1 - 11 and 13 positions ahead respectively. By race's end, Castroneves clawed his way through the field, passing nine cars for position, to capture P6 ... one position ahead of Scott Dixon at P7 and one position behind Ryan Hunter-Reay at P5 - so much for no passing. Helio Castroneves now leads all competitors by 31 points which is a net gain of two going into the last five races of the season. If Castroneves goes on to capture the season championship for 2013, without an additional win in the season (only the Firestone 550 in Ft. Worth), this would represent another couple of first-time occurrences - wouldn't it? Ultimately, the Honda Indy 200 at Mid-Ohio Sports Car Course echoed the claim expressed on a recent Facebook entry left at The EDJE - Geoff Gray Another good Indycar race ... its the best racing on TV bar none and they proved it again today ... Another first time winner the points are still relatively tight and Charlie Kimball proved that he can pull off a slide job going into Madness! 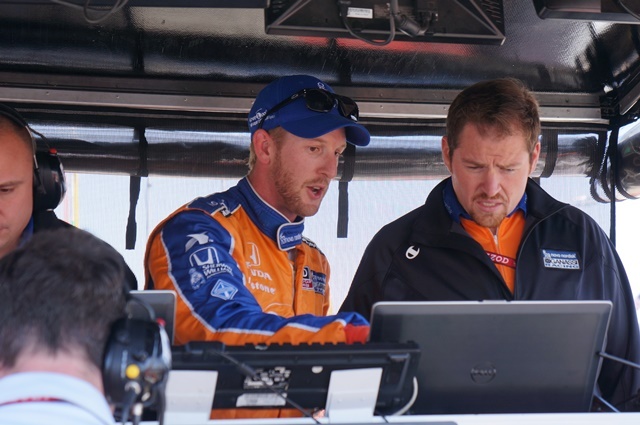 All of this adds up to a win for Charlie Kimball, win for Helio Castroneves, and most of all, a win for American open-wheel racing fans for a product and effort that is well worth watching in any year, but especially here at Mid-Ohio's Honda Indy 200. 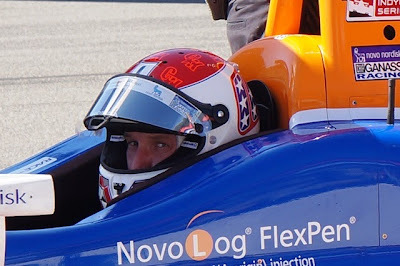 Duncan Ende, driver of the Global Motorsports Group’s no. 24 STANDD / Merchant Services Audi R8 LMS, is looking for a rebound of sorts at this weekend's Pirelli World Challenge doubleheader at the Mid-Ohio Sports Car Course for the Honda Indy 200 at Mid-Ohio presented by StopTech Brakes. Struggling through the World Challenge weekend three weeks ago on the temporary circuit at Exhibition Place in Toronto, Ontario, Ende would finish in sixth place but never quite came to grips with the bumpy circuit in his first real visit to the circuit. "Toronto was like a bad first date," said Ende, who it must be said, is married. "I had such high hopes, but in reality, it was completely forgettable. I had actually driven there once before in ChampCar Atlantic, but we had a big crash in practice and didn't make the race. Perhaps, Toronto isn't my kind of circuit which is too bad because it produces some really great racing. However, Mid-Ohio has been much kinder to me over the years - in fact, I won an American Le Mans Series race there in a monsoon two years ago with my friend Spencer Pumpelly." Mid-Ohio, however, may not be a circuit that suits the strengths of Ende's Audi R8 when it is compared to the Cadillac CTS-V.R's and the Volvo S60s that he has battled with throughout the season. Where the Audi may have a strength lays in its ability to conserve tires better than the competition - this may be the ticket if both races stay green for long periods of time. Double races equal double points for the weekend and a chance to make a double move. 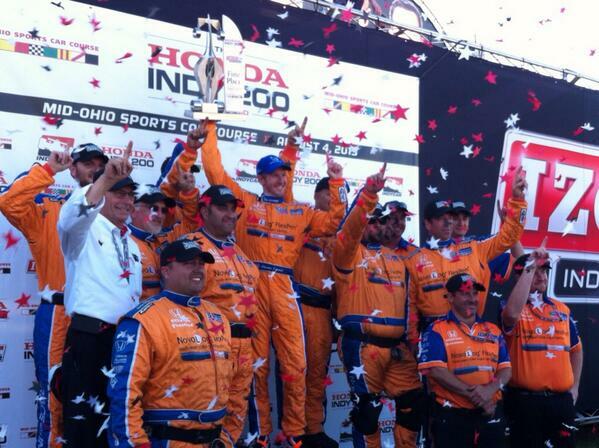 "Mid-Ohio is definitely hard to pass on, but is also a very demanding circuit," said Ende. "So while we may not be able to be quickest from the standing starts and it takes a few laps for the Audi to get heat in its tires, if the race goes green for a long time we'll be looking good while everyone else will be starting to run out of tires. 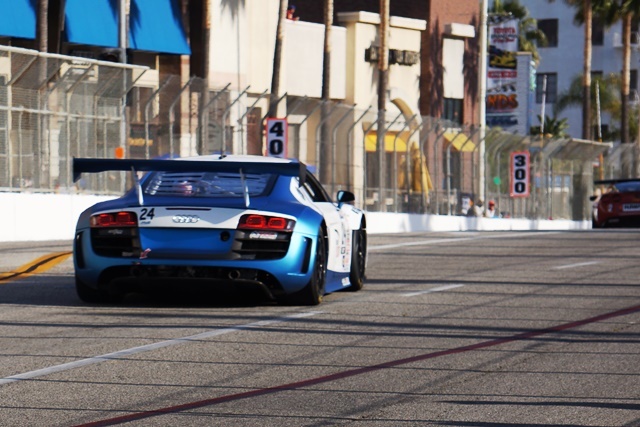 Once we are able to build heat, the Audis will be extremely quick around Mid-Ohio. If we can make it through Toronto with no yellow flags, I'm hoping we can do the same at Mid-Ohio." 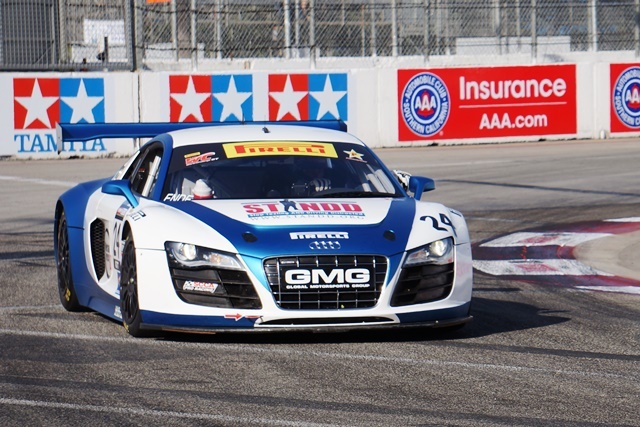 While Toronto was the racing equivalent to a first date that ends with the comment 'It was so nice to meet you', it did have the benefit of helping Ende move up in the GT class of the SCCA sanctioned Pirelli World Challenge championship. Ende now sits seventh in the standings, with 727 points. The first race of the Mid-Ohio World Challenge GT/GTS doubleheader will be Saturday, August 3 at 11:40 AM ET, with the second on Sunday, August 4 at 1:35 PM ET. Both races will be streamed live at world-challengetv.com. A television broadcast from Mid-Ohio will air on Sunday, August 18th at 2:00 PM ET.